Thank you everyone for a great year!!! The Goshen Crimson Marching band head east to compete in the Bands of America Northwest Ohio Regional Championship at Bowling Green University. It will be a long day for the students, but they will get experience competing against top notch programs from 5 different states. Visit the staff page for a listing of staff members and their email addresses. 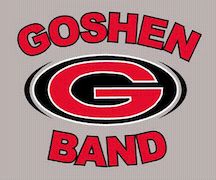 This site is operated by the Goshen High School Band and Guard Boosters.